You are here: Home | Exhibitor search | ARGOSY RESEARCH INC.
No.15-3, Niupu S. Rd., Xiangshan Dist. 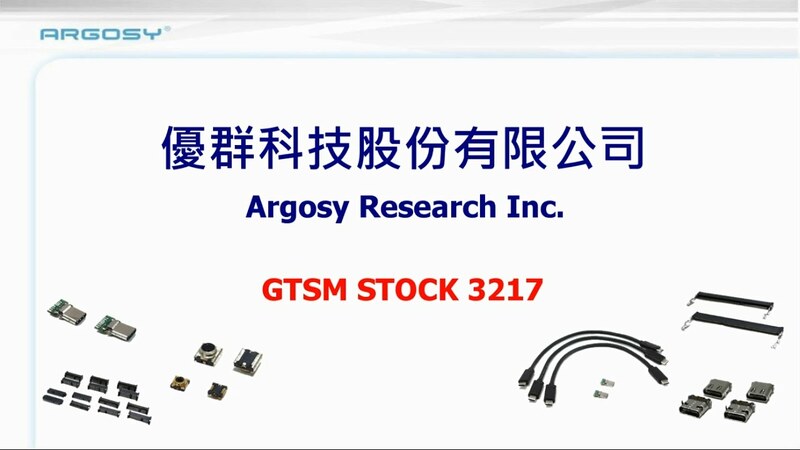 Argosy Research Inc. is the professional Taiwan connector manufacturer for 30 years, and been IPO since 2004 with Taiwan Stock No. 3217 (capital USD 26m & 2017 turnover USD 52.1m). So far, our DDR, M.2(NGFF) & Mini PCI Express connectors occupy the No.1 market share (30-40%) in worldwide consumer electronics. Our connectors, antenna and cables are equipped with unique functions, e.g.waterproof (IP68), high frequency and high speed, which applying for Telecommunication, Military-Industrial, Consumer and Automotive Electronics. We launch over 20 USB Type-C connectors for multi-devices, like PC, mobile, automotive & audio/video solutions, and also involve in next-generation connector development, like DDR5 sockets. Customoised connector design & service are also available. We have 7 global locations, including of 3 factories- Hsinchu (Taiwan HQ & factory), Taipei (Taiwan office), Kunshan (China factory), Suining (China factory), San Jose (US office), Shenzhen (China office), and Chongquing (China office). In addition, our facilities obtained critical certificates: EICC 5.1 Silver certificate, RBA 6.0, IATF 16949, QC 08000, OHSAS 18001, ISO 9001, ISO 14001 & ISO 16064. Our company management are farsighted that we keep improving the manufacture and automation in Taiwan to effective risk diversification against potential global economic conflict. Besides, we acquire plating license in 2012 as the environment regulations getting stricter, and hence we can provide total solution and quality assurance with our vertical integration & automation manufacture. Argosy's DDR, M.2(NGFF) & Mini PCI Express connectors occupy the No.1 market share (30-40%) in worldwide consumer electronics.